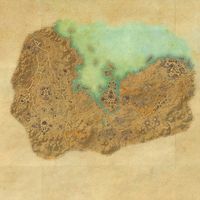 Stonefang Isle is an island located north of Ebonheart, in northern Stonefalls. It is home to the Daedric ruins of Stonefang Temple, built atop the subterranean Stonefang Cavern beneath. 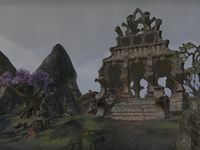 The island was first occupied during the Merethic Era by the Chimer people, ancestors to the Dunmer, who built an extensive Daedric temple in basalt rock. It was dedicated to the Good Daedra: Azura, Mephala, and Boethiah. Eventually the island and the temple became abandoned. The ruins were briefly reoccupied in 2E 582 by the Worm Cult and the Daedric minions of Molag Bal, acting as a lair within which the Daedra could sacrifice mortal souls to fill the Mortuum Vivicus. The Daedra were swiftly purged from island by the Fighters Guild, which was under the effective control of Meridia at the time.